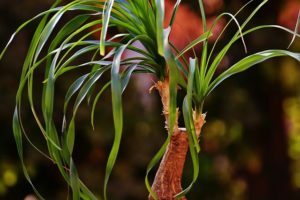 If you are worried about indoor dust and pollution and would like to purify and detox your indoor air, these 5 plants could do wonders for your health and indoor air quality. Getting stuck indoors all the time can make you sick, literally! Especially, if you use toxic chemical based cleaners, have things like fireplaces, furnaces, or smokers at home. So, why not try to bring nature indoors with some of these healthy indoor plants, and clean your indoor air naturally? Here are 5 indoor plants that work as natural air cleaners and purifiers. Aloe Vera is a great plant to have indoors. It’s so beneficial and full of natural goodness that it’s almost magical. It’s been used for thousands of years as a medicine, and also as an ingredient for skincare and beauty products. Aloe Vera is a easy to grow plant that purifies your indoor air. It absorbs carbon dioxide and releases oxygen 24 hours a day. It also filters formaldehyde and benzene. Growing lemongrass in pots is one of my favorites. These plants have excellent flavor and fragrance, and can do wonders for your home. Lemongrass has been a part of ancient Chinese medicine for thousands of years. If you are into cooking Asian cuisine, you’ll never have to buy it from a grocery store. Growing lemongrass indoors, in containers, is easy and can be an “all year round project” because you can harvest these plants over and over again. Snake plants are cheap, low maintenance and beautiful enough to keep in your bedroom, living room, or anywhere in the house, all year round. They need very little care, can grow in any climate, and purify and detox your indoor air. Snake plants come highly recommended by a NASA Scientist and researcher, Kamal Meattle. Many dwarf indoor fruit trees are suitable for growing in large containers. Lemon leaves give out a refreshing fragrance for your home and can be added to a number of dishes. Drinking freshly squeezed lemon juice in warm water detoxes your body. 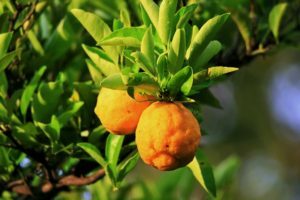 Lemon trees are easy to grow indoors from starter plants or seeds. Plants like Gerbera Daisies and tulips are among the many flowering plants effective in removing formaldehyde from the air. Flowering plants make your home beautiful. They also filter out carbon dioxide, produce oxygen, and purify air. These plants need extra care and careful watering. You can also try some easy growing azalea in your indoor container garden. Growing plants indoors is a healthy way to detox, purify and refresh your indoor air quality. They also provide you with fresh foods and make your home beautiful. It’s not difficult to grow these plants indoors in containers, just make sure to choose a well-lit spot and water them regularly. P.S: To learn more and ask your questions, please join us on our weekly webinars. If you miss any of these sessions, you may watch the replays by joining the EAT Community, where you’ll also find hours of lessons on topics like Alternative Health and Ecolonomic Agriculture.